This post has been due for a long time, 2 years, to be exact. Feb 2017, I was in Hyderabad with Mridula and Varghese, and we were making Pizzas for dinner. The dough rose dutifully and splendidly, and the toppings had to be decided. It is not often I get a chance to cook along with either of my daughters, and the ‘pizza making’ became an event. Little Natasha ‘loooves’ strawberries. All of us like goat cheese on pizza (or on anything, actually). And then was born the thin crust Strawberry Goat Cheese Pizza, with Balsamic vinegar. I know what you are going to say. Strawberry? On Pizza? The ‘I don’t want Pineapple on my Pizza’ people will give me a stern look (or worse). 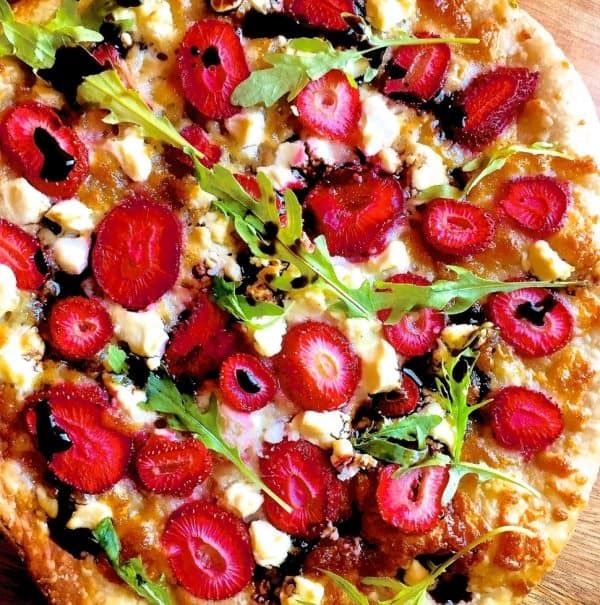 All I can say is, just make this Strawberry Goat Cheese Pizza for yourself before you judge. It is not at all a sweet pizza. It is savoury and delicious. Just Try It! It will make happy memories for pizza with loved ones, just as it did for me. We made some great pizzas that day, different toppings for each. Small rectangular or round ones, to fit into the OTG. My cooking range at Bangalore can accommodate large sized pizzas, as well as having a wide range of temperature settings. It was the first time I was working with an OTG, and that too with a max temperature setting lower than I normally have for pizzas. In hindsight, that is why the strawberry goat cheese pizza came out so well. 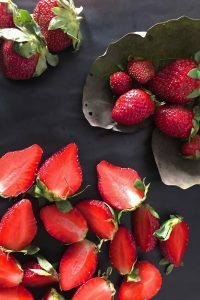 Subsequently when I made it at Bangalore, the strawberries were cooked to a crisp, the cheese was discoloured. After several attempts a bulb clicked on in my head (metaphorically speaking, of course). In Hyderabad, the max temperature of the OTG was about 210C, so to be safe, we baked pizza at 200C. In Bangalore I set the temp. at 250 C. No wonder the strawberries had all their colour and juice baked out of them! 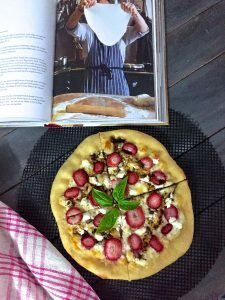 Now I bake the strawberry goat cheese pizza at 180 C – 200 C max, and increase the bake time from 12 to 20 minutes. And I get perfect looking strawberry pizza, with the crust baked just right. Mridula suggested the flavours for the pizza: a lovely Balsamic Vinegar and a little honey, to go with the fresh strawberries. We put the strawberry slices to soak in the balsamic-honey liquid, and then set them on the pizza with feta cheese and mozzarella. In this recipe however, I have made a balsamic reduction and only used it to dress the pizza after it is baked. I have also now made it with goat cheese. Feta cheese and mozzarella are as good options as goat cheese and mozzarella in this pizza. The balsamic reduction in this recipe will turn out to be more than you require for one pizza. Balsamic reduction can be stored in the fridge for several weeks and used as required. The theme for the 182 Foodie Monday Blog Hop is “Down Memory Lane“. As the name suggests, we have to post the recipe for any dish that takes us back in time with any of our loved ones. Making this strawberry pizza for my grand daughters has been such a fun event. Whether here or in the USA with Lakshmi, the little ones watch eagerly and try to help. The sons in law say that the pizza is delicious! These evenings of baking pizzas with family, has given some lovely memories. And a great recipe too! The theme for this week on Foodie Monday Blog Hop, was suggested by Swaty Malik, who blogs at Food Trails. Do check her site with its very tasty offerings, from recipes for fasting to feasting, and jams, breads, dals etc. It is a storehouse of delightful food. For the pizza dough for the Strawberry Goat Cheese Pizza, I followed the recipe from the River Cottage Veg Cookbook, with some deviations though. 1 cup Mozzarella Cheese- shredded Or sufficient to cover the pizza base except for a round margin of 1"
Transfer the still hot pizza to a serving tray or plate. Arrange the shredded basil leaves on top and drizzle a little balsamic reduction across the pizza. Your Strawberry Goat Cheese Pizza is ready! I agree Veena, not everyone likes the sharp taste of goat cheese. If you can get fresh cheese instead of the packaged one, you may like it better! Pizza with Strawberry toppings is a unique combination. I have yet to try my hands on a thin crust pizza too and this one with goat cheese and balsamic reduction sounds a perfect choice to begin with. Bookmarking the recipe ! Thank you Poonam! Every since I learnt to make pizza dough, Ive been relishing these lovely thin crust home made pizzas. 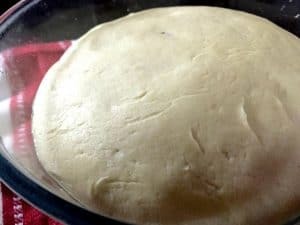 I make dough once a week and store some of it for use for a quick tasty dinner. Thank you, Seema! I used to long for thin crust pizza which until a couple of years ago was not easily available in India, so I learnt to make it for myself! Fruits in Pizza !!!! much interesting one…. Love to use season’s fresh strawberries in the pizzas……..Addition of goat cheese must be adding a lovely color combination here ….. Thank you, Sasmita! The Pizza is surprisingly savoury and the goat cheese was fresh and full of flavour! Thank you Mayuri! Yes its such a happy time when a family cooks together, each contributing their bit! Sujata I am drooling over the pics. The explanation that you have given about the heat to bake pizza makes me think I can do it too. Thanks to you I am going to venture into a new kind of toppings for pizza. Thats lovely Sasmita! I will post my fig pizza soon, I think you would like that too! Recently at a local Pizzeria here, we tasted some dessert pizza with various toppings like apple crumble, apricots with feta and blueberry pie filling …kids loved dessert pizza but those were too sweet for me.. . 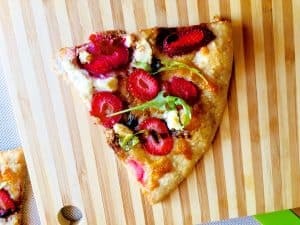 When I saw the pic of your Strawberry Pizza I thought it to be as a dessert pizza recipe, glad to know that it’s a savoury Pizza a kind of sweet and salty taste that I love.the Pizza looks delectable with beautiful strawberries.. yumm ..and yes cooking with your loved ones do create special memories especially when kids are around for their small inputs!! Thank you Swati! Im not overfond of the dessert type pizzas either. I add pineapple slices to pizza sometimes, and then this strawberry and I also make a fig pizza. Otherwise I stick to the regular Margherita and Mediterranean pizzas! Thank you Kalyani! I love pineapple on my pizza and will check out your post too! I could simply lick that balsamic reduction.. so my kinda stuff! I am a big fan of pineapples on pizza provided they have jalapenos for the spice and I agree, it doesn’t taste sweet. In fact it helps blend all flavours of dough, spices sprinkled on the top and a glaze could do wonders. Loved the recipe and no one can say NO to pizzas these gorgeous. Your description makes me drool. Balsamic vinegar honey strawberry sounds super tempting. Pizza also looks so beautiful. Baking with little one is such a lovely memory. Perfect for the theme. Thank you Sujata Roy. Its so nice that my grandchildren all three love food and are comfortable in the kitchen, helping out as best as they can. And its such a pleasure cooking for them on the rare occasions I meet any of them! I love the look and sound of this pizza, Sujata! I’m sure the combination of balsamic vinegar, goat cheese and strawberries tasted just awesome. Just right for Valentine’s season too! Thank you Priya! Remember we talked about this pizza once, when you saw a picture of it on my FB page? Hmm. Will talk and see how I can help! The Bub would love this pizza, the way my grandchildren do!